A dishwasher that doesn't do its job is a pain in the appliance budget. The good news is that many simple repairs can be completed without having to call an expensive repair man or replace the failing machine entirely. Simple repairs to stop a dishwasher from leaking, creating a clamor or failing to make your dishes sparkle are relatively inexpensive and easy for the average dish owner to complete. 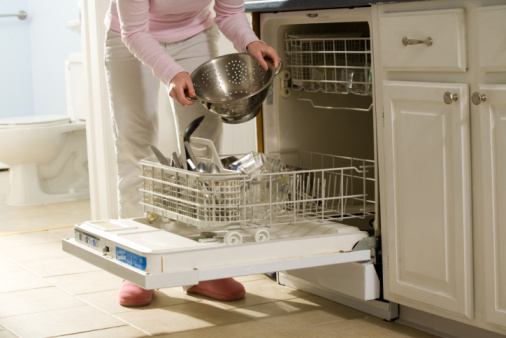 A dishwasher is a relatively simple mechanism with pumps, spray arms, timers and hoses. If any of these get clogged or don't function properly, it can lead to difficulties throughout the machine. The timer regulates the cycle length, and a sensor detects air temperature and water flow so that the dishwasher doesn't overheat or leak. Checking sensors in the tub and door of the dishwasher and cleaning them regularly is an excellent way to keep a dishwasher in good working order. Noisy dishwashers seem to be the bulk of consumers' complaints to dishwasher repair places. The squeaky wheel gets the grease, so to speak, although a clanking dishwasher is more likely a problem of wear and tear rather than lubrication. A bump and grind when your dishwasher is running could point to a worn washer arm bearing or a loose hose rattling around the housing. If the spray arms are wobbling during operation, it will cause a racket in the tub when the dishwasher begins its cycle. This is more than likely due to a worn wash arm seal or bearing ring that is loose. Tighten them and check them for cracks to alleviate noise. A faulty pump can also cause a rise in racket. If your water won't drain, the pump located at the bottom of the dishwasher could be at fault. A thorough cleaning can get it back in working order. A new pump canbe purchased at most home improvement stores and replaced in an afternoon. If the problem is dishes that are left with gunk and powder on them after the cycle, it could be a simple solution of cleaning out the spray arms. Remove the spray arm at the bottom and possibly attached to the top basket according to your manuals instructions. Most snap on and off without much hassle, while others have a cap that screws it into place. Clean the holes with a vinegar solution or scrub them with a fine brush to remove any buildup. Also check the float. If it is raised, the dishwasher won't be able to fill with water. A clogged inlet screen or valve that isn't working properly can also give you gunk on your glasses. When you start a wash cycle and begin to hear it filling, open the door and check that the basin has enough water to reach the heating coil. Check the float valve, inlet valve and screen if the water isn't rising.